Rope breaking strength is determined in a standard test wherein fittings are attached to the ends of the rope and the rope is pulled in a straight line. If, however, the rope passes over a curved surface (such as a sheave or pin) its strength “is decreased.” The amount of such reduction will depend on the severity of the bend as expressed by the D/d ratio. For example, a rope bent around a pin of its own diameter will have only 50% of the strength attributed to it in the standard test. This is called “50% efficiency” (Fig. 38). 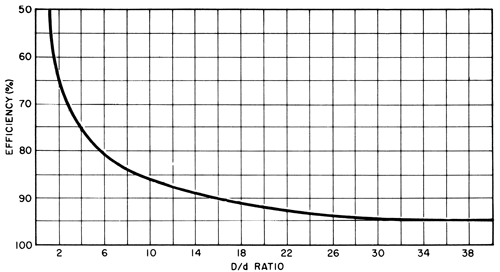 Even at D/d ratios of 40, there may be a loss of up to 5%. At smaller D/d ratios, the loss in strength increases quite rapidly. The angle of bend need not be 180º, 90º, or even 45º; relatively small bends can cause considerable loss. All discussion of strength pre-supposes a gradually applied load not to exceed one inch per minute. The following discussion relates to conventional 6- or 8-strand ropes that have either fiber or steel cores; it is not applicable to rotation-resistant ropes since these constitute a separate case. In actuality, there may be a third source of stretch – a result of the rope rotating on its own axis. Such elongation, which may occur either as a result of using a swivel, or from the effect of a free-turning load, is brought about by the unlaying of the rope strands. Because the third source is a subject that is beyond the scope of this publication, discussion will be directed to constructional and elastic stretch. When a load is applied to wire rope, the helically-laid wires and strands act in a constricting manner thereby compressing the core and bringing all the rope elements into closer contact. The result is a slight reduction in diameter and an accompanying lengthening of the rope. Ropes with wire strand core (WSC) or independent wire rope core (IWRC) have less constructional stretch than those with fiber core (FC). The reason for this is the fact that the steel cannot compress as much as the fiber core. Usually, constructional stretch will cease at an early stage in the rope’s life. However, some fiber core ropes, if lightly loaded (as in the case of elevator ropes), may display a degree of constructional stretch over a considerable portion of their life. A definite value for determining constructional stretch cannot be assigned since it is influenced by several factors. The following table gives some idea of the approximate stretch as a percentage of rope under load.